Prime Minister Dr. Keith Rowley. PRIME Minister Dr Keith Rowley says a report by former ambassador Christopher Thomas will be sent to a parliamentary committee in a week. He was responding to a prime minister's question in the House on Friday from Naparima MP Rodney Charles on when the long-promised Organisation of the American States (OAS) report by former ambassador Christopher Thomas will be laid in Parliament. Rowley said: "There is no long promise OAS report. There is a report that was done by former ambassador Christopher Thomas and it is Government's intention to send that report to the Foreign Affairs Committee of the Parliament and I intend to do that...within a week." The Committee on Foreign Affairs is a joint select committee and one of its roles is to consider all matters relating to the foreign policy of the government (including missions abroad) and examining the implications and likely effect on TT. It also looks at international treaties and other agreements entered into by Government on behalf of the State and advises Parliament on the likely impact on TT. Thomas was chosen by Cabinet to probe TT's rejection of Dominica's plea for a two-year waiver of dues at an OAS meeting held on March 23. Dominica sought the waiver after being devastated by Hurricane Maria in September 2017. At a post-Cabinet media briefing in April, Rowley said the incident left him "shocked and embarrassed." He praised Minister of Foreign and Caricom Affairs Dennis Moses and lamented that ahead of the critical vote at the OAS, where TT is represented by Brigadier General Anthony Phillips-Spencer, TT had no presence at a preparatory meeting where the waiver was agreed to by other OAS states. On May 10, in Parliament, in response to a query from Charles about when the findings of the Thomas report would be made public, Rowley responded the report was is in the hands of the Office of the Prime Minister but would be sent to the committee as soon "as it was appropriate". Charles asked if the Prime Minister was prepared at this stage to say whether the report attached responsibility to any party for issues which arose from the incident. 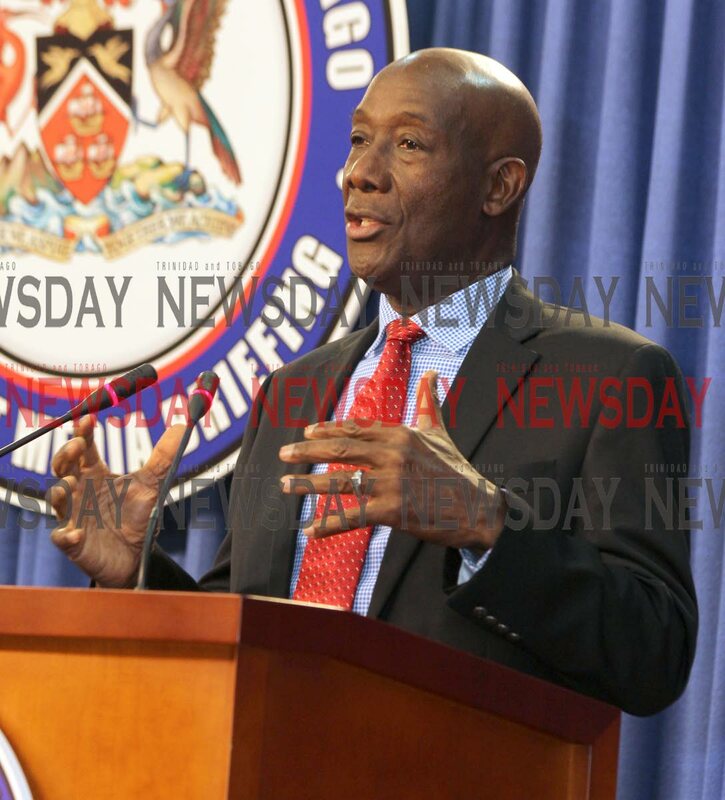 Rowley responded the contents of the report indicate there were shortcomings on the part of people who hold office. Rowley was also asked by Pointe-a-Pierre MP David Lee how much money had been spent on designs for Sandals in Tobago given recent statements by Sandals Resorts International chairman Gordon "Butch" Stewart. Rowley responded that Lee misunderstood Stewart as Government has spent no money but has liabilities for work done on advancing the project. He said the project is driven by the Government and is responsible for the equity expense. He added Government has invited the three large business houses to take equity: ANSA McAL said no, while Massy and Guardian Life said they might be interested. "We also said if there are other equity investors who we approve of who might be interested in the project we would be glad to have them to reduce Government's exposure. However, we've also said if no other equity investors are forthcoming the Government of TT will do it. Because we realise that this is a major part of the national infrastructure and it's important to Tobago economy and with or without other equity partners the Government of TT will do it." Reply to "Dominica report for House committee"